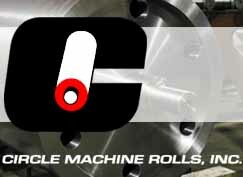 Circle Machine Rolls, Inc. supplies a large variety of custom precision rolls and shaft configurations for a wide and diverse base of industrial applications. We are particularly skilled at supplying rolls to 60 inch plus diameter to 240 inches long. Please contact us for other roll types and finishes. Click a thumbnail to view the larger image. Click the larger image to launch viewer.